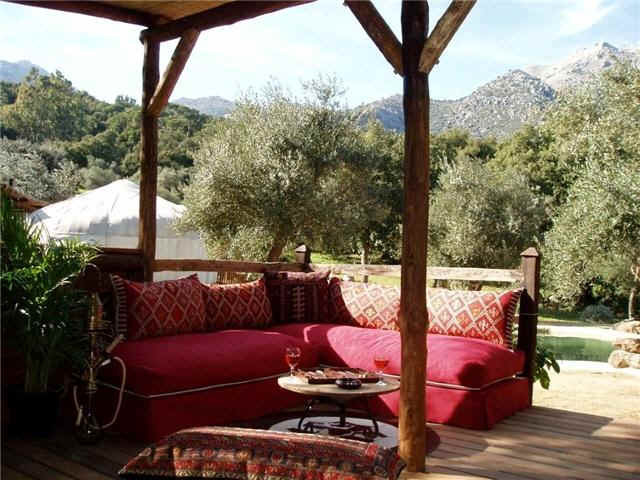 property description: the Hoopoe Yurt Hotel’s location is idyllic, set in three hectares of olives groves and unspoilt cork oak forest, and with spectacular views of the Grazalema mountains of Andalucia, in the rugged wilds of southern Spain. Staying in one of our yurts is the perfect way to enjoy the stunning scenery, allowing you to get back to nature without forgoing the usual luxuries you would wish for on your holiday. The yurts have private bathrooms, as well as an acre of private meadow with hammocks and comfortable shaded seating areas. This is the perfect place to unwind and relax, and soak up the sights and sounds of nature right on your doorstep. Fall asleep lulled by the sound of goats' bells and crickets. 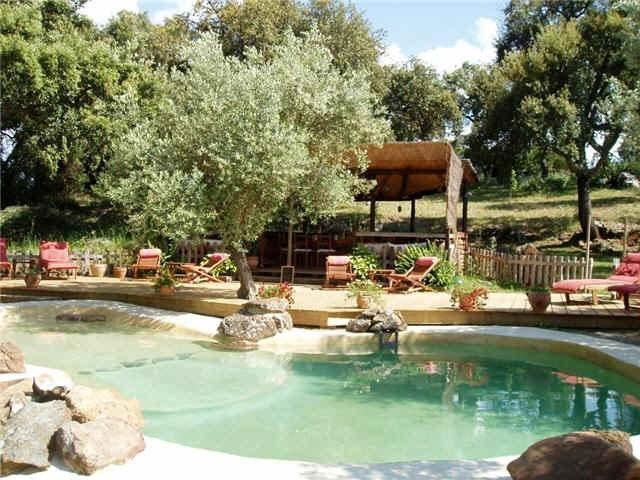 Lounge in a hammock in the shade of a giant cork oak tree. Cool off with a dip in our refreshing chlorine-free swimming pool, surrounded by blue mountains and the beauty of nature. 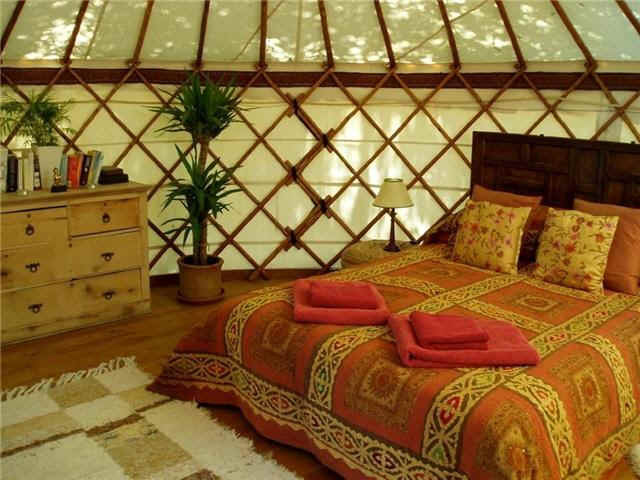 accommodation: choose between five very different styles of yurt. The Mongolian yurt is in a quiet secluded clearing and is handpainted in burnt orange with traditional motifs in green, blue and gold. The Afghani yurt is more romantic with bent willow poles and a deep red ceiling, making it cosy and intimate. 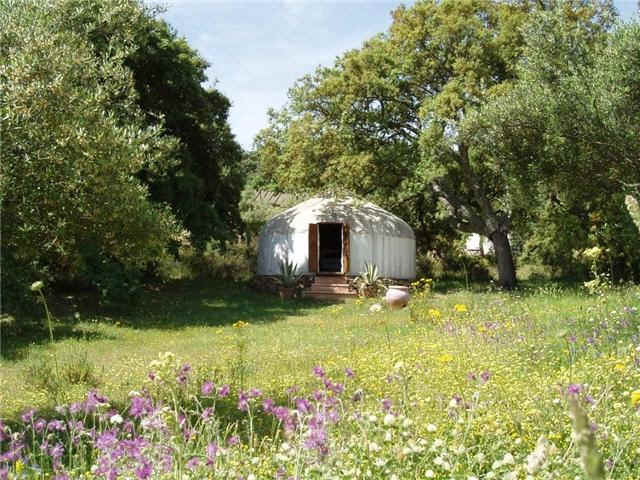 The Jaipur yurt is made of coppiced chestnut and is light and airy, with dappled light filtering down through the cork trees. The Safari yurt has a lovely view of the meadow, and is decorated in rich earthy colours. The Maimani yurt, named after its large Afghan kelim from the village of Maimani, is also made of coppiced chestnut, and is larger, with closer lattice and more roofpoles. 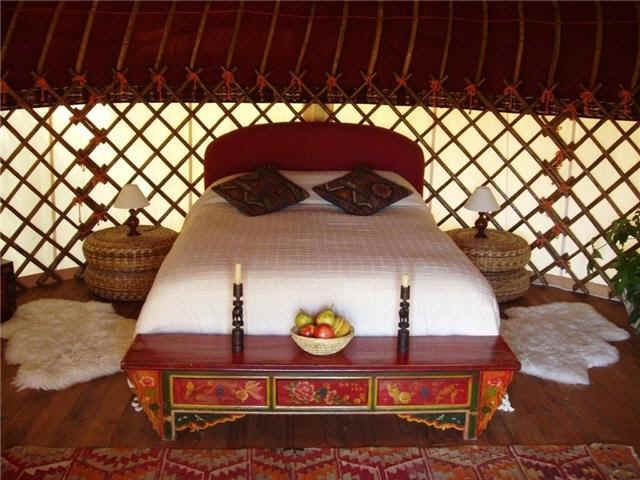 The yurts are all set up as double rooms with comfy beds, and pieces of traditional Mongolian furniture and exotic textiles. The camp runs on solar power and the yurts have overhead and bedside lights as well as sockets for charging mobile phones and laptops. They all have private bathrooms with hot showers and ecological toilets. location: An hour and a half by car from Jerez airport (Ryanair) and a two hour drive from both Gibraltar airport (Monarch and British Airways) and Málaga airport (Monarch, Easyjet and others). The drive from Jerez is particularly pretty. If you are coming to The Hoopoe by public transport the easiest airport to arrive at is Gibraltar. Walk out of the airport and across the border (a couple of hundred metres), then hop into a taxi to San Roque (10 to 15 minutes) and then onto the train to Cortes de la Frontera (50 minutes) where we can pick you up. The Hoopoe Yurt Hotel, Apartado de Correos 23, Cortes de la Frontera 29380 Málaga, Spain.